Last night, my wonderful friends threw a baby shower to celebrate Hannah Min. It was truly an incredible night, and I am so glad that I will be able to tell Hannah how many people loved her, long before we even got to hold her in our arms. We started the night having dinner at a Chinese restaurant. Loved that. 🙂 My fortune cookie read, “You will soon have a pleasant surprise”. How true that turned out to be. We played some games, had a toast, and I opened so many sweet, individualized gifts for sweet Hannah. The last present was something that will be a lifelong treasure. It was a 100 wishes quilt that my friends and family all contributed toward. In China,there is a tradition to welcome and celebrate a new life by making a “Bai Jia Bei”, or 100 Good Wishes Quilt. 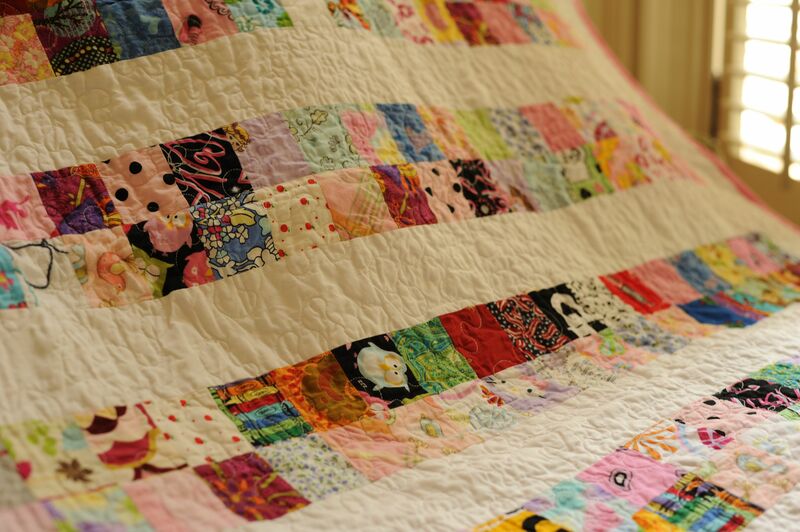 Traditionally, friends and family all contribute pieces of cloth for the quilt, along with a good wish for the baby. Part of the material goes into the quilt, and then a small piece goes into a scrapbook along with a note for the baby. Words can really not express how moved I am by this quilt. So much thought and love went into the pieces of material that are now all sown together to welcome this child from across the world. It is an incredible treasure. Thank you so much to everyone who shared a piece of yourselves for our girl!! So glad that you finally got to see the quilt! 🙂 Julie did a great job coordinating the whole process and it turned out great! Yay! So glad you have it now! 🙂 I agree with Amy ~ Julie did a wonderful job coordinating this whole process! I’m so glad you love it. 🙂 It was really special to be a part of it! There are so many people who love you, your family, and now Hannah, the newest member of your family!